I am the head of the Department of Childhood Education and a senior lecturer in mathematics education. I teach foundation phase mathematics courses and research methods in mathematics education at undergraduate and honor. I supervise masters and doctoral students. My areas of interest are on research in mathematics teaching, instructional approaches that enhance effective teaching of mathematics at elementery level as well as mathematics teacher training and mentorship. 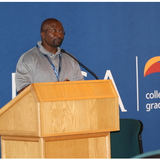 Dr Kakoma Luneta is an Associate Professor of Mathematics Education in the Faculty of Education and former Head of the Department of Childhood Education at the University of Johannesburg. Dr Luneta completed his PhD in Mathematics Teacher Education and Mentorship from the University of Witwatersrand and Masters in Mathematics Teacher Education from the University of Sussex in England. His research interests are in Mathematics Teachers Education; Secondary and Elementary Mathematics; Mathematic cognition; Professional Development of Mathematics Teachers; Mathematics Cognition; Misconceptions and associated errors in mathematics learning; Action Research and Mentorship. He has taught mathematics and physics in various Northern and Southern African countries, the UK and the USA. He was recently appointed a visiting Associate Professor of Mathematics Education in the Faculty of Education of the University of British Columbia in Vancouver Canada and was once a Visiting Scholar at Stanford University in the US, and currently a Visiting Scholar at the University of Cambridge – Centre for Neuroscience Education. He has published two books, over 30 book chapters and article in accredited journals. Kakoma Luneta updated their profile information. Kakoma Luneta changed their profile image.